Cut along the dotted lines of the school bus base pattern to obtain the additional segment pattern guide. Secure the back end of the bus on your yellow foam and use your pencil to draw around the pattern. For each additional segment you want to add, continue to place the segment pattern next to the last drawn edge moving toward the front of the bus. When you are finished adding segments, place the front of the bus pattern next to the last added segment and draw along that pattern. You will also need to adjust the black stripe of bus side, blue background piece and the gray road and green grass pieces. 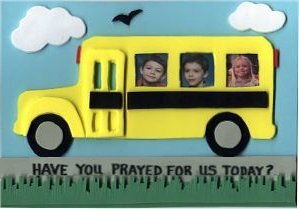 To do this add 1 and 1/4 inches for every additional segment that you added to your school bus base. Instructions for making Grass; You will be cutting out 2 strips of foam for the grass. One piece is to be placed "as is" at the bottom of your Light Blue Background piece. The other piece needs to be cut with grass details. To do this; cut straight lines into the foam along one edge of the strip of foam (being careful not to cut completely through the strip). The lines should be close to each other to resemble blades of grass. After cutting the lines, randomly make some of the cut lines shorter than others all the way across the strip. (see photo) This detailed piece of grass strip will be positioned over the first green strip of foam. For the Road Message; (optional) If you are making your frame/magnet to be used as a prayer reminder, you will want to write the reminder on the gray road strip before assembly. Or you can use letter stickers if you want. Optional Red Lights; To add the look of small red lights at the front and back of the bus, cut out little rectangles of red foam. When assembling your project, apply the glue on the side that you drew the pattern on. This way any pencil lines on your pieces will not be showing on your finished project. To assemble the pieces, start at the bottom of the project and work up. First glue plain green grass strip, then glue gray road piece directly above the green strip. Glue detailed green grass strip on top of plain gras strip. Before gluing bus, Center bus and wheels above the road to find good placement. Glue the other pattern pieces into their places as shown in the picture above. Insert trimmed pictures and Post on a refrigerator at home or a file cabinet at work. Also a Great project for a "Moms in Touch" Group to do together.